If you’re stuck in an endless loop trying to load Windows 10 updates, you’re probably not alone. It’s like watching a PC bang its head against the wall, over and over and over again. Sometimes the cumulative update fails. You see a message saying “Installation failed” or some such followed by “Undoing changes.” When your system comes back to life an hour or two or five or six later, it goes right back to trying to install the same stupid cumulative update. You get the same error. Wash, rinse, repeat. You might want to let your system go through the full self-mutilation cycle twice, just to see if you get lucky, but after that it’s just too painful. You need to put Windows 10 out of its misery. Fortunately, Microsoft has a tool that tells Windows Update to stop looking for the specific cumulative update that’s causing problems. The tool wasn’t built for stopping cumulative updates dead in their tracks, but it works nonetheless. Go to KB 3073930 and download Microsoft’s Wushowhide tool. 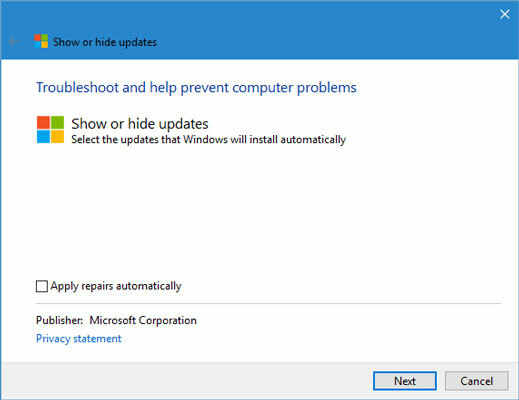 Click the link marked “Download the ‘Show or hide updates’ troubleshooter package now.” Drag the downloaded file, wushowhide.diagcab, to any convenient location. Double-click wushowhide.diagcab to run it. This part’s important and easy to miss: Click the Advanced link. Deselect the Apply Repairs Automatically option. Click Next. To get wushowhide to hide updates, go to the Advanced options and turn off Apply Repairs Automatically. Wait for Wushowhide to look for all the pending updates on your system. When it comes up for air, click Hide Updates. There should be a box marked “Cumulative Update for Windows 10 Version 1607 for x64-based (or x-32 based) Systems (KB xxxxxxx)” or something similar. If you’re curious whether you’ve found the wight wascally wabbit, look at Microsoft’s Win10 update history log and compare the KB numbers. Select the option for the latest Cumulative Update, click Next, and close out of wushowhide. Windows hides the update for you. The Windows Update program won’t even see the update unless you specifically unhide it. Deselect the Apply Repairs Automatically option. Click Next. Wait for wushowhide to look for all pending updates on your system. When wushowhide comes up for air, click Show Hidden Updates. Select the box marked “Cumulative Update for Windows 10 Version 1607 for x64-based (or x32-based) systems” and then click Next. This is weird, but wushowhide will tell you that it fixed the problems found. Click Close. That should unhide the update you previously hid. At this point, you can go back into Windows Update (Start, Settings, Update & Security, Check for Updates). Windows will find the cumulative update and install it for you. Although cumulative updates frequently contain security updates, sometimes you just have to put Windows Update out of its misery. Frequently, error number 0x80070020 accompanies a failed cumulative update installation and rollback. All too frequently, it’s followed by another attempt to install the cumulative update, and another failure, with the same error code. Once you’re back on your feet, you should try to figure out if any of your files are locked. (Error 0x80070020 generally means a file that the installer needed was locked.) Common culprits include corrupt Windows system files, antivirus programs, and some video drivers.